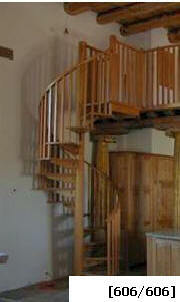 This is a multilevel, solid oak, staircase was built to UBC code specifications. The portioned pictured is of the second level with an exit to access the second story floor or you can continue up to the third level. The staircase has a continuous handrail that follows the staircase onto the well rail around the opening. Stair is a 72" diameter with 30 degree treads; handrail is a # 237 (2 3/4" x 2 3/8") molded oak; balusters are a # 348 (1 1/4" square) that has a slight taper to the top of the baluster, four per tread for a spacing of less than four inches. The treads are # 142 (1 1/2" thick) and the landings # 436 (1 1/2" thick) 90 degree square. Center column is 6" diameter with a custom shape. This stair was built in one section and then splice into two sections for shipment. The final finish on the wood was furnished by others.